It was rainy and 60 degrees in D.C. yesterday, which finally got me thinking about fall clothes! Of course it's back to nearly 80 today, so sweater weather may still be a while away. That's why I love to slowly introduce fall colors and trends into my late summer wardrobe. I'm loving plaid and tweed, lots of denim, floral and lace details and hues of tan, blush and olive green. 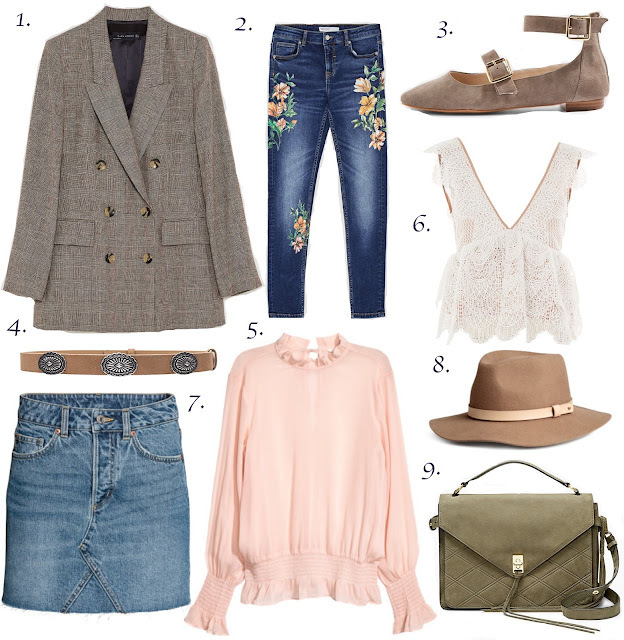 Stay tuned for more of my autumn picks as the temperature drops! I highly recommend checking these earrings out, and if you have sensitive ears that don't do well with heavy dangly styles, you are in luck because these have sparkly posts that hold them in place. Shay Collection also makes fab necklaces and bracelets. Shop some of my other favorites here, here and here. Happy August! I know I should probably be sharing my early fall fashion picks, but it is 90 degrees in D.C. so cool weather clothes are the last thing on my mind. Instead, I thought I'd share my latest obsession with one-shoulder tops. I think they are a new and fun spin on this season's popular off-shoulder style. I wore the above look while visiting my friends in Chicago for my birthday weekend. The top is actually a stretchy bodysuit that I know will be a great staple this summer and the rest of the year. The flowy, striped pants were a Marshall's find, but I've linked a similar pair. They remind me of those fab gaucho pants we all wore in the fourth grade from Limited Too. I also had to share my friend Nikki's AMAZING dress. Also, here's one more off-shoulder look I wore for a Sunday exploring Union Market in D.C. If you are ever in the area, I recommend going there for amazing food, live music and adorable pop-up shops.